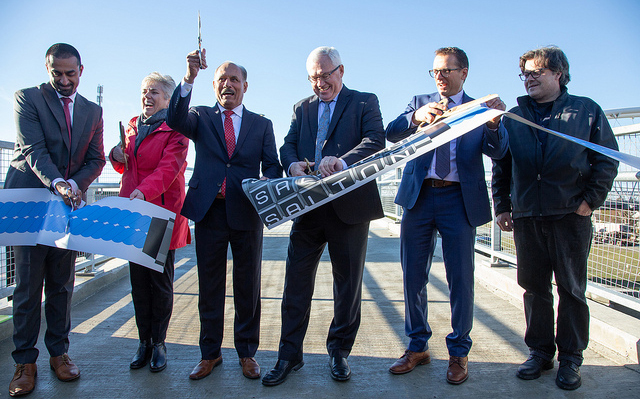 UFV’s connection to the Abbotsford community received a big boost last week with the opening of the Salton pedestrian/cycling bridge. 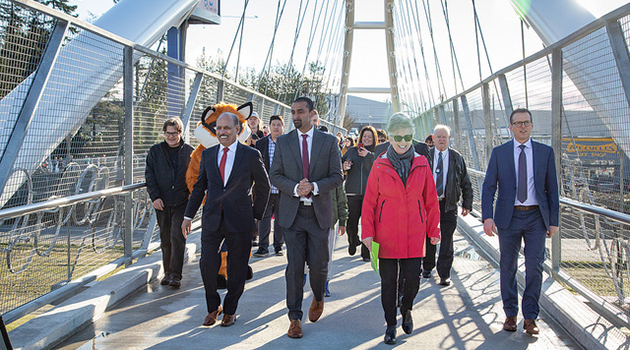 The bridge will help to improve mobility and safety for pedestrians and cyclists traveling to and from the UDistrict and also aligns with the City of Abbotsford’s strategic goal to enhance multi-modal transportation systems to support walking, cycling and transit across the community. The project is funded from a $1 million grant from the Province of British Columbia’s BikeBC Program as well as $3.3 million from the Federal Gas Tax Fund. 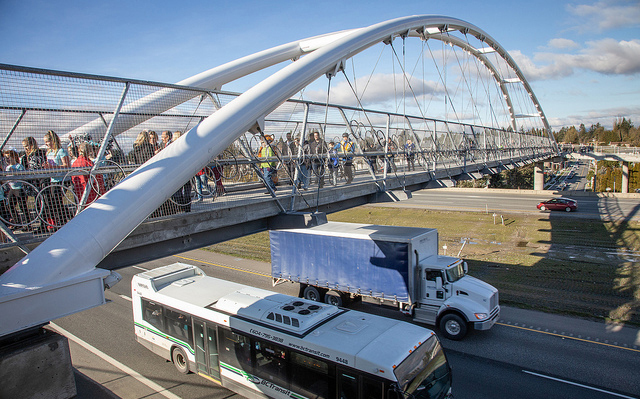 The 77 metre clear-span bridge was constructed and assembled on the Highway 1 median, minimizing impacts to Trans-Canada Highway 1 users. The bridge was successfully lifted into place on October 21, 2018. The new pedestrian/cycle bridge project also includes the widening of Salton Road to allow for on-street parking and a dedicated cycle path. A new pedestrian signal was also installed at the Salton Road/King Road intersection and the traffic signal at Salton Road and Marshall Road was upgraded to accommodate the new cycle path. Public art enhancements from artist Brent Bukowski have been incorporated as part of the bridge design. Brent Bukowski is a Canadian artist who works with reclaimed materials, primarily metal and glass. Brent’s art was inspired by the imagery of a bicycle jump sequence using reclaimed aluminum bicycle rims assembled in a playful arrangement that hops, skips and jumps across the busy highway below. VP External Craig Toews was interviewed for a CBC story on the new bridge and its impact on campus life and the new U-District.